Diagram of the Lagrange points associated with the sun-Earth system. A Lagrange point is a location in space where the combined gravitational forces of two large bodies, such as Earth and the sun or Earth and the moon, equal the centrifugal force felt by a much smaller third body. The interaction of the forces creates a point of equilibrium where a spacecraft may be "parked" to make observations. These points are named after Joseph-Louis Lagrange, an 18th-century mathematician who wrote about them in a 1772 paper concerning what he called the "three-body problem." They are also called Lagrangian points and libration points. There are five Lagrange points around major bodies such as a planet or a star. Three of them lie along the line connecting the two large bodies. In the Earth-sun system, for example, the first point, L1, lies between Earth and the sun at about 1 million miles from Earth. L1 gets an uninterrupted view of the sun, and is currently occupied by the Solar and Heliospheric Observatory (SOHO) and the Deep Space Climate Observatory. L2 also lies a million miles from Earth, but in the opposite direction of the sun. At this point, with the Earth, moon and sun behind it, a spacecraft can get a clear view of deep space. NASA's Wilkinson Microwave Anisotropy Probe (WMAP) is currently at this spot measuring the cosmic background radiation left over from the Big Bang. The James Webb Space Telescope will move into this region in 2018. 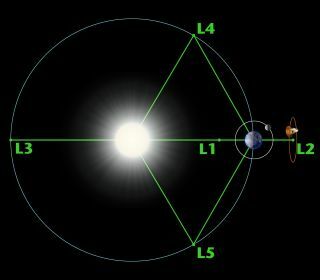 The third Lagrange point, L3, lies behind the sun, opposite Earth's orbit. For now, science has not found a use for this spot, although science fiction has. L1, L2 and L3 are all unstable points with precarious equilibrium. If a spacecraft at L3 drifted toward or away from Earth, it would fall irreversibly toward the sun or Earth, "like a barely balanced cart atop a steep hill," according to astronomer Neil DeGrasse Tyson. Spacecraft must make slight adjustments to maintain their orbits. Points L4 and L5, however, are stable, "like a ball in a large bowl," according to the European Space Agency. These points lie along Earth's orbit at 60 degrees ahead of and behind Earth, forming the apex of two equilateral triangles that have the large masses (Earth and the sun, for example) as their vertices. Because of the stability of these points, dust and asteroids tend to accumulate in these regions. Asteroids that surround the L4 and L5 points are called Trojans in honor of the asteroids Agamemnon, Achilles and Hector (all characters in the story of the siege of Troy) that are between Jupiter and the Sun. NASA states that there have been thousands of these types of asteroids found in our solar system, including Earth’s only known Trojan asteroid, 2010 TK7. L4 and L5 are also possible points for a space colony due to their relative proximity to Earth, at least according to the writings of Gerard O'Neill and related thinkers. In the 1970s and 1980s, a group called the L5 Society promoted this idea among its members. In the late 1980s, it merged into a group that is now known as the National Space Society, an advocacy organization that promotes the idea of forming civilizations beyond Earth. If a spacecraft uses a Lagrange point close to Earth, there are many benefits to the location, the Jet Propulsion Laboratory's Amy Mainzer told Space.com. Mainzer is principal investigator of NEOWISE, a mission that searches for near-Earth asteroids using the Wide-field Infrared Survey Explorer (WISE) spacecraft that orbits close to our planet. While WISE is doing well with its current three-year mission that concludes in 2016, Mainzer said, a spacecraft placed at a Lagrange point would be able to do more. Far from the interfering heat and light of the sun, an asteroid-hunting spacecraft at a Lagrange point would be more sensitive to the tiny infrared signals from asteroids. It could point over a wide range of directions, except very close to the sun. And it wouldn't need coolant to stay cool, as WISE required for the first phase of its mission between 2009 and 2011 — the location itself would allow for natural cooling. The James Webb Space Telescope will take advantage of the thermal environment at the sun-Earth L2 point to help keep cool. L1 and L2 also “allow you to have enormous bandwidth” because over conventional Ka-band radio, the communication speeds are very high, Mainzer said. “Otherwise, the data rates just become very slow,” she said, since a spacecraft in orbit around the sun (known as heliocentric orbit) would eventually drift far from Earth. In 2016, NASA released a video of the Earth spinning through an entire year. The time-lapse was based on 3,000 pictures taken every two hours by the EPIC camera on the Deep Space Climate Observatory (DSCOVR) satellite, which was at L1. Besides showing pretty views, EPIC provides scientists with metrics on climate such as cloud height, ultraviolet reflectivity, or ozone and aerosol levels. In February 2017, the OSIRIS-REX mission — then on its way to asteroid Bennu — spent about 10 days looking for additional Trojan asteroids in Lagrange points near Earth. "That would be the most fascinating thing we could discover," mission lead scientist Dante Lauretta, a planetary scientist with the University of Arizona's Lunar and Planetary Laboratory, told a NASA science advisory group in January. The search revealed no new Trojans, but perhaps other spacecraft will look again in the future. A 2017 study suggests that Trojan asteroids near Mars are from the planet, and not captured asteroids from other regions in space. The smoking gun is that at least three of Mars' nine Trojan asteroids are high in olivine. This mineral is rare in asteroids, but common on larger bodies (including Mars, which has it in impact basins). While Earth and Venus have olivine as well, lead author David Polishook, a researcher at the Weizmann Institute in Israel, told Space.com that it's much easier for Mars to capture asteroids from its own surface. Reference Editor Tim Sharp contributed to this article. European Space Agency: What Are Lagrange Points?